The leaves are the most nutritious part of the plant, and are a significant source of B vitamins, vitamin C, provitamin A as beta-carotene, vitamin K, manganese and protein, among other essential nutrients. 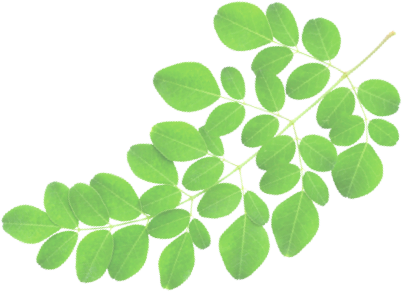 When compared with common foods particularly high in certain nutrients per 100 g fresh weight, cooked moringa leaves are considerable sources of these same nutrients. The immature seed pods, called ”drumsticks”, can be prepared in a curry. They remain highly nutritious, especially in vitamin C and like the leaves, are also a good source of dietary fiber, potassium, magnesium and manganese. The seeds, can be removed from mature pods and eaten like peas or roasted like nuts. They contain high levels of vitamin C and significant amounts of B vitamins and dietary minerals. Mature seeds yield anywhere from 30–40% by weight of edible oil. The seed cake remaining after oil extraction may be used as a fertilizer, animal feed or as a flocculent to purify water. For its medicinal value, various parts of this plant such as the leaves, roots, seed, bark, fruit, flowers and immature pods act as cardiac and circulatory stimulants, possess: antitumor, antipyretic, anti-epileptic, anti-inflammatory, anti ulcer, antispasmodic, diuretic, antihypertensive, cholesterol lowering, antioxidant, antidiabetic, hepatoprotective, antibacterial and antifungal activities. The leaves are the most nutritious part of the plant, and are a significant source of B vitamins, vitamin C, provitamin A as beta-carotene, vitamin K, manganese and protein, among other essential nutrients.